Tesco has been blamed after one of its suppliers, Northern Foods, revealed it will close its Trafford Park Bakery in Manchester, with the loss of 690 jobs. The site produces a range of chilled pastry products, but made a loss of £3m in 2005/06. The firm said it expected a phased closure of the site by December. Northern will also cut 210 jobs from its Palethorpes plant in Shropshire. The GMB union said Tesco needed to "practise corporate responsibility". The firm said it had been "supportive". The move by Northern is part of a shake-up announced in May after poor sales triggered two profit warnings. The General Workers Union said it was "surprised and shocked" by the decision to close "the Old Trafford plant [which] is dedicated solely to supplying Tesco". "Tesco should talk to Northern Foods about finding a viable future for this plant, which employs 690 local workers," said Jude Brimble, GMB national officer. "This is another example of Tesco throwing their buying power weight about by depressing prices and moving production at will to other plants. "There is such a thing as corporate social responsibility and Tesco need to start practising this. "GMB will be asking the OFT, which is currently looking at the power of the supermarkets, to examine this specific case as an abuse of power. "Tesco and Northern Foods owe to these loyal workers to pause and look for another way forward." Northern Foods makes own-label goods for food retailers, and branded foods such as Fox's Biscuits and Goodfella's pizza. Under the planned revamp of the company, Northern is set to sell businesses that account for 40% of its group revenues. The company is aiming to focus on its key food categories, which include pizzas, biscuits and ready meals. 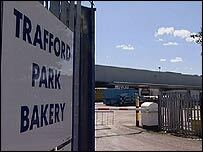 The shutdown of the Trafford Park site is part of Northern's plans to sell its pastry division. The company said it would be carrying out consultations with workers before the closure of the plant was confirmed. A Tesco spokeswoman said: "It is very unfortunate that Trafford Park is closing and that Northern Foods have taken the decision to resign Tesco's pastry business at the site. "Over time we have been as supportive as we can be to improve the performance of the site. "When Northern Foods told us that they were closing Trafford Park we asked if we could move this business to another site or sites but have been told there is not enough capacity to do this. "We continue to work closely with Northern Foods who still supply us with a significant number of other products across other areas of our business. "We are working with our supply base to ensure availability of sausage rolls, pies and quiches for our customers."